Are you seeking a closer relationship with God? We have certified spiritual directors who are available to guide you in your journey. Spiritual direction is a relationship in which one person (director) accompanies another (directee) in the search for a deeper friendship with God. What can I expect from spiritual direction? 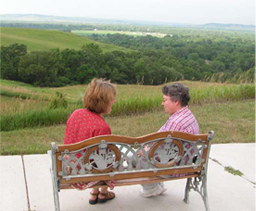 The spiritual director and directee meet once a month for approximately an hour. Directees share their experience of God, faith, struggles and prayer. The directee should have a basic faith in God and a desire to deepen that relationship. Directee should be willing to commit time and energy to prayer and seek to be honest with themselves, the director, and God. The Director is a person who has received training in spiritual direction and continues with ongoing study, spiritual growth and prayer. She listens attentively, affirms the presence of God in the directee’s life, and helps interpret the directee’s experience in the light of faith. The director may at times confront the directee gently and make suggestions for spiritual growth. Where do you think God is leading you? How has your faith been tested/strengthened? What are you hearing the Lord say to you? What do you think God is calling you to? What would Jesus do in your situation? What challenges do you face in your relationship with God, with others? Is there an area in your life where you may be resisting grace?